The task force charged with creating a new formula for distributing state education funding to New Orleans schools announced its final recommendations Wednesday, with a vote scheduled for early next month by the state Board of Elementary and Secondary Education. Since the rise of the post-Katrina charter system in New Orleans, schools in the city have received their funding according to two different formulas. 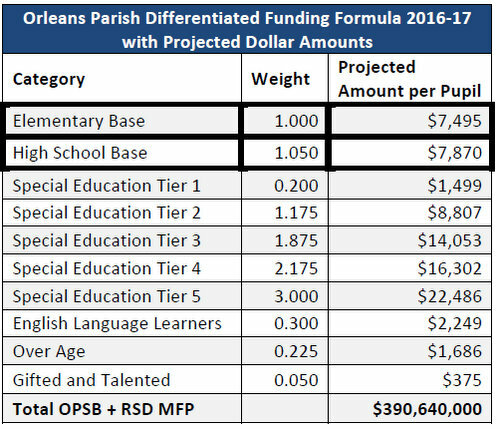 Those under the governance of the Orleans Parish School District were funded according to the same formula as schools across the rest of the state, which provides some extra weight for both gifted and talented students as well as those in special education. Schools in the Recovery School District, however, received funding under a formula weighted exclusively for students with special needs, with the weights increasing based on the severity of each student’s needs. A new state law — increasingly seen as a step toward returning ending the RSD’s presence in New Orleans and returning those schools to OPSB control — requires all schools in New Orleans to receive their funding under the same formula. The task force was charged with creating that formula, and the final version retains the tiered weighting for special education from the RSD formula with a few new, small increases for high-school, gifted or over-age students. The task force voted 10-1 in favor of the proposed new formula, with the lone ‘no’ vote cast by Kathy Riedlinger of Lusher Charter School — which has been contemplating legal action against it. A twelfth member of the task force, Ken Ducote of the Greater New Orleans Collaborative of Charter Schools, abstained from the vote. Another letter of support was signed by representatives of the Firstline, KIPP, ReNEW, Success Prep, New Beginnings, Collegiate Academies, Choice Foundation, and ARISE networks. New Orleans College Prep CEO Ben Kleban described the unified funding formula earlier this month as a key step in the path toward proposed legislation that would return all RSD schools to OPSB control. Lusher, Audubon and other schools had expected to face significant cuts to their annual budgets under earlier iterations of the new formula, and had begun rallying their school communities against it. The final proposal from the task force, however, contains a provision that no school will face more than a 2-percent cut from its current-year per-pupil funding. As tax revenues increase each year, the base amount of the formula will increase as well. According to the proposal, those schools that face cuts based on the formula will not see those increases, however, until their allocation from the formula rises above the amount they receive next year. In other words, if schools like Lusher and Audubon would receive cuts of deeper than 2 percent next year under the new formula, they won’t see an increase in per-pupil funding until the base tax revenues increase beyond that point — so while the initial cuts may not be deep, it is unclear when their budgets would grow again. Citing “the potential for prospective litigation,” Lusher board chair Blaine LeCesne referred all questions about the funding formula to the school’s attorney. Lusher board members have said they may meet Saturday (Feb. 27) to make a final decision on whether to take legal action against the new formula. OPSB Superintendent Henderson Lewis and RSD Superintendent Patrick Dobard will present the formula to the state Board of Elementary and Secondary Education’s finance committee at 9:30 a.m. March 3 in Baton Rouge (at the Claiborne Building, 1201 N. 3rd Street).